To begin, draw the desired image on a piece of foil. 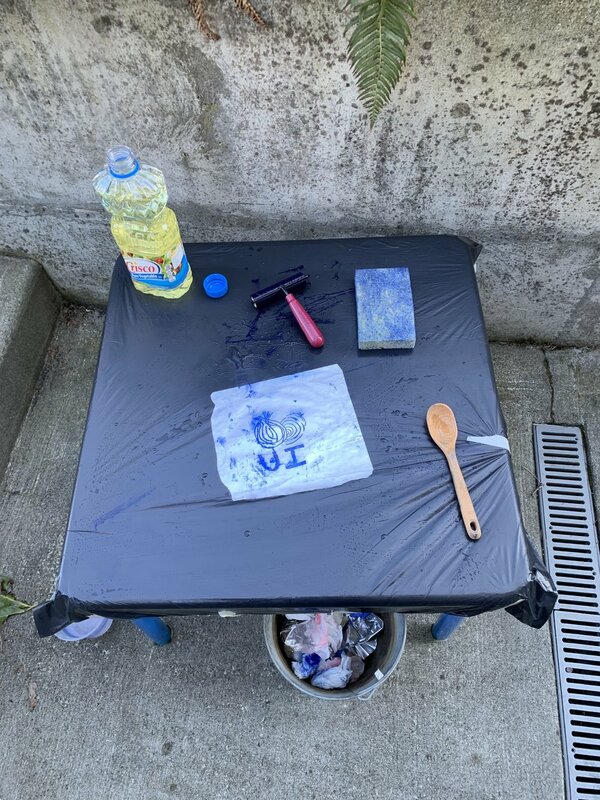 Any oily places on the foil will etch, so it is best to use gloves for this step, or otherwise not touch your hand to the surface of the foil. Remember that all text should be written backwards on the foil “plate” in order for it to appear correctly when printed. Next submerge your foil into cola for 5-7 minutes, being careful not to touch the surface. When the time has elapsed, remove the foil from the cola and rinse well. Take the foil “plate” to your printing station. At this stage you may wish to use vegetable oil to remove any excess sharpie from the plate. The sharpie ink may prevent the printing ink from reaching full saturation. Apply vegetable oil to a paper towel and clean the “plate” thoroughly. Continue to buff until the oil has dispersed as thinly as possible. The inking phase is the most technically difficult, as it requires the correct water to ink ratio in order to create a beautiful print. Using a sponge, apply water liberally to the surface of the foil. Then, use the sponge to distribute the water until the surface of the foil is evenly damp. Roll your brayer through your ink, making sure that it is evenly and thinly coated. Then roll the brayer across the surface of the foil, using long even strokes and applying very little pressure. Repeat this process of sponging and inking the foil “plate” until the image is visually darkened with ink. 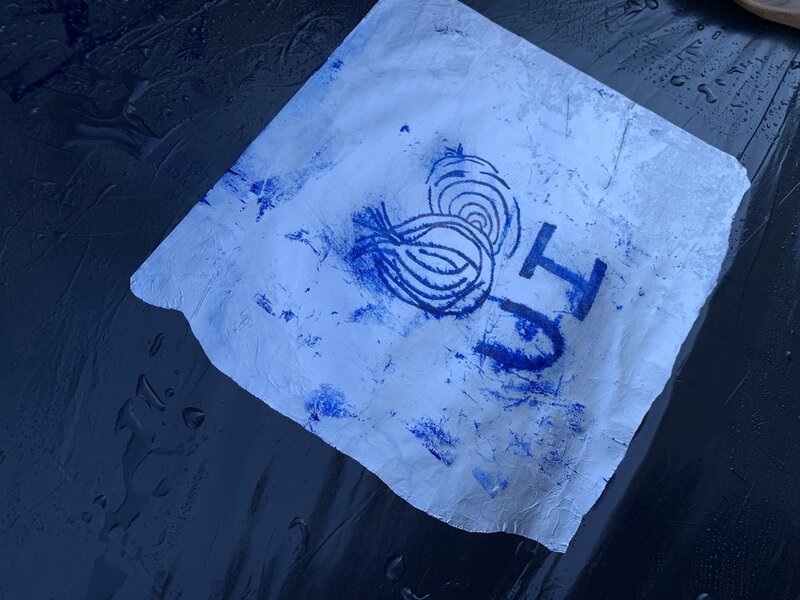 You may use a little vegetable oil on a paper towel to clean up any excess ink on the surface of the foil, if you do not wish those marks to transfer to your final print. Once you have inked your foil “plate,” place a piece of paper over the surface. Make sure that you are laying the paper evenly and flatly so that the image will transfer completely. Using a wooden spoon, gently rub the paper. This will help the image to transfer. It is important to use the spoon’s pressure evenly and in the areas where the image is located in order to obtain a good print. When you feel that you’ve transferred the image, peel up the paper to reveal the final print. This project cost around a hundred dollars in supplies. The ink is the most expensive component. While this up-front cost may seem steep, the materials will last for many printings. With very limited experience I was able to get five copies out of one foil “plate” but I have heard that up to twenty are possible. Special thanks to Kim Van Someren, Claire Cowie, the UW Printmaking Association, and the University of Washington School of Art, Art History + Design.